Book ten in the Brides with Grit series has been released! Remember Ethan Paulson, the poor groom who was left at the altar in Sarah Snares a Soldier? His bride-to-be, Sarah Wilerson, took off on the horse named, Nutcracker, to catch her true love, Marcus Brenner. Ethan’s been heartsick ever since…but that’s about to change when Helen Higby and her four little girls move into his hotel at the end of Lorna Loves a Lawyer. Helen Heals a Hotelier is sweet historical romance set in 1873. Helen Higby answers an ad for a mail-order bride, but finds out her groom is already married—and wanted by the law—after their wedding ceremony. Now stuck in Clear Creek, Kansas, with her four little girls, Helen needs a way to provide for her family. Ethan Paulson is in charge of the family hotel while his parents take an extended trip. Ethan’s fiancée, Sarah Wilerson, left him at the altar last summer and he’s had a hard time accepting her rejection—until a beautiful woman and her children take up residence in the Paulson Hotel. Helen had worked in a hotel in Pennsylvania before traveling to Kansas, so she helps Ethan organize and improve the offerings of the Paulson Hotel, while falling in love with him. Sparks fly when Mrs. Paulson, Ethan’s mother, returns to find changes, including a family making themselves at home in the hotel, and in Ethan’s heart. Can chaos and drama turn into love and a happy ending for everyone living in the Paulson Hotel? Read a preview of Helen Heals a Hotelier now. Please enjoy this new story of a couple finding love on the Kansas prairie. Sarah Snares a Soldier, book 5 in the Brides with Grit series debuts today on Amazon, and Smashwords for all other types of ebook readers. Here’s the story line: A clean, sweet historical romance set in 1873. Rancher’s daughter Sarah Wilerson has been engaged to Ethan Paulson, a Clear Creek hotel manager, for two years. Although Ethan is a nice man, Sarah has postponed the wedding twice, unsure whether she can live and work in the family’s hotel—alongside an overbearing mother–in–law. West Point–trained Captain Marcus Brenner was stationed at Fort Wallace in western Kansas, and wounded in a skirmish with the Cheyenne Indians. He has been discharged from the army and recuperating at his uncle’s ranch in Ellsworth County, Kansas. There he meets Sarah, who helps him recover from his wounds and nightmares. Marcus falls in love with Sarah, but refuses to consider marrying her because of her engagement to another man. And, due to his battle injuries, he may not be able to give Sarah the houseful of children for which she yearns for either. Unable to bring herself to go through with her wedding on the third date set, Sarah leaves her groom at the altar and rides after Marcus, determined to convince him to marry her. Fate throws a challenge in their path when they suddenly become guardians of six young children. Can Sarah convince Marcus to become the father the children need, and the husband she wants? Cora Captures a Cowboy, book 4 in the Brides with Grit series debuts today on Amazon and Barnes & Noble. Here’s the tagline: She has four days to talk the cowboy into marrying her…or it’s back to Boston as another man’s bride. And for the first time ever – the Millie Marries a Marshal ebook is FREE on Amazon! Here’s the tagline: This mail-order bride arrived to find out her groom has died! So, she moves into the town marshal’s house…and into his heart. Click fast to read this sweet, clean historical romance, as its only available for $0.00 on June 12 and 13th. Please enjoy all the books in the Brides with Grit series and share with others about them. I’d appreciate it! My latest book, HILDA HOGTIES A HORSEMAN, the third book in the Brides with Grit series, debuted this week. The setting of Ellsworth, Kansas in 1873, was easy to work with because it was a major cattle shipping town between 1872 to 1875. Abilene, Kansas was famous, being the first place to ship cattle by railroad to eastern towns in 1867, but that ended in 1871 when businesses and farmers got tired of the damage and disease the herds caused in the area. One can find a vast amount of information on the internet about the cattle drives which went through Kansas in the 1870’s. Here’s some interesting tidbits, written by F. B Streeter in 1935, for an article in the Kansas Historical Quarterly. Drovers are recommended to make Ellis, Russell, Wilson’s, Ellsworth and Brookville the principal points for their cattle for the following reasons: Freedom from petty annoyances of settlers, arising from the cattle trespassing upon cultivated fields, because there is wider range, an abundance of grass and water, increased shipping facilities and extensive yard accommodations. Large and commodious hotels may be found in all these places, and at Ellsworth, especially, the old “Drovers’ cottage,” so popular with the trade for years, will be found renovated and enlarged. The banking house of D. W. Powers & Co., established at Ellsworth in 1873, in the interest of the cattle business, will remain at this point and continue their liberal dealings as in the past. As stated above, Ellsworth became the principal shipping point for Texas cattle on the Kansas Pacific Railroad in 1872. The first three droves of longhorns that season arrived in Ellsworth early in June. These droves numbered 1,000 head each. Two weeks later a total of twenty-eight herds, numbering from 1,000 to 6,000 head each, had arrived and many more were on the way. The fresh arrivals contained a total of 58,850 head of longhorns. These, together with over 40,000 head which had wintered in the county, made a total of more than 100,000 head of Texas cattle in Ellsworth county. 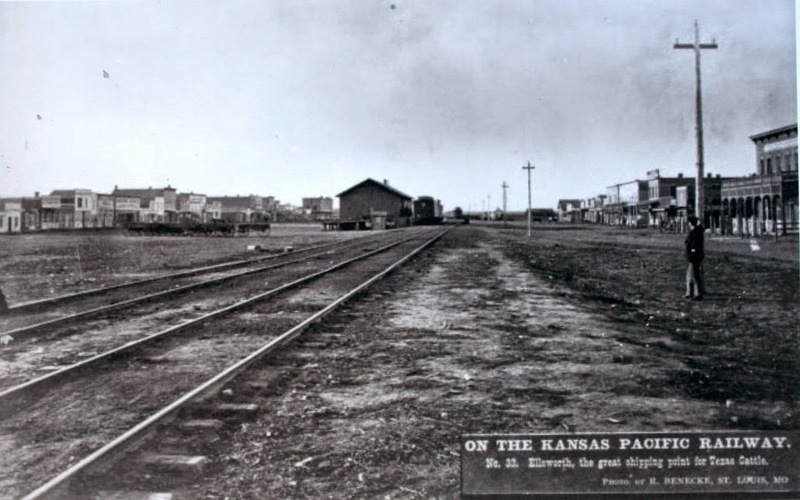 That season 40,161 head were transported from Ellsworth, or one fourth of the total number marketed over the Kansas Pacific…Besides those shipped by rail from Ellsworth, about 50,000 head were driven to California and the territories from that place. In the months of June and July more than 100,000 head of beef and stock cattle changed hands at Ellsworth. Drovers found buyers on their arrival, enabling them to close out at a good price and return to their homes. The prices paid for cattle that season were as follows: $19 to $22 for beeves; $15 to $18 for three-year-olds; $9 to $10 for two-year olds; $12 for cows; and $6 for yearlings. My first thought on reading this? Wow! That’s a lot of cattle to surround the town! A new book, a new series, and new genre. Rania Ropes a Rancher, the first book in my new historical western romance series, Brides with Grit, debuts at midnight tonight. It’s a long process for me to go from an idea to the finished book. I start writing the story—and the characters take over. Their dialogue continues in my brain during my dreams, on walks…and usually when I’m not right at my computer so I have to remember them later and try to reconstruct their conversations. And then the editor makes some suggestions on her first read through…and the characters throw in another thought or two…but that’s the joy of creative writing, it just keeps flowing and adding to the story line. I knew the series name I wanted to use, but the individual titles did not come to me until—crediting my editor again —she made a suggestion, which triggered my thoughts in a new direction. If I change Greta’s name to Rania…the title could be Rania Ropes a Rancher. So the first book in the Brides with Grit debuts tomorrow, and I have the titles and story lines for the next seven books outlined too. My mind has already written half of Millie Marries a Marshal. Now my fingers need to get busy typing Millie’s story. Please download the ebook verison or order the paperback to start the story of the Wilerson and Hamner families. The year is 1873 and the setting is near the famous cowtown of Ellsworth, Kansas. Enjoy my latest story about women living on the Kansas prairie!